Yesterday’s marketing strategies don’t work anymore. Learn how to harness the newest opportunities. 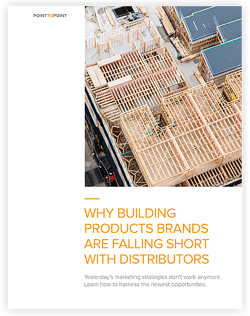 Building products manufacturers using the same old marketing approaches to reach today’s busy distributors may well be missing the mark. New research shows that traditional outreach efforts—like lunch and learns, phone calls and training seminars—are losing ground as effective ways to engage distributors, build loyalty and boost business. The reality of the distributor’s business environment has appreciably changed. Bombarded with both online and offline interactions, today’s time-crunched distributors are spread too thin. We’ll show you ways to break through, reconnect and engage distributors, creating new opportunities as you help them work more effectively, mastering their time management frustrations. Complete the form to download the whitepaper and regain ground with distributors.